Funny how often two challenges collide, or rub shoulders. I had barely posted Urban Design on Friday when the Weekly Photo Challenge loomed into view : Nostalgic. Old films and Nat King Cole. But that very morning I’d been reliving nostalgia at the top of Christ Church tower. I’d been on a mission to purchase a few “surprises” for my husband’s birthday next week. The sky was blue. My camera was in hand. 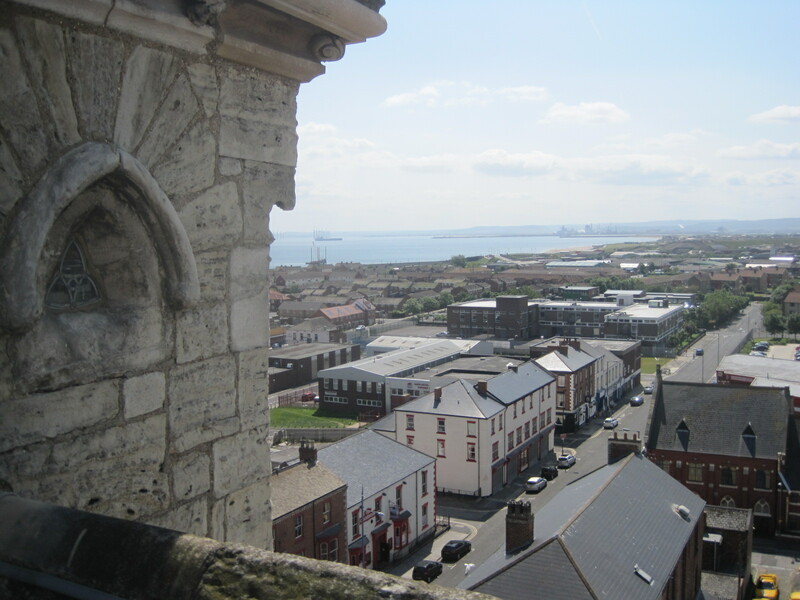 What better time to climb the tower for the promised “bird’s eye view” of Hartlepool? I reached the top and was just starting to take some shots when I heard the door open behind me. Darn, I thought. It wasn’t a large space and I greedily wanted it all to myself. The lady smiled at me, and of course, I smiled back, and as I never can resist doing, slipped into conversation. She had been born and raised in the town, but had later married an American and now lived in the States. Over the years she had visited mum and dad in Hartlepool, but now both were dead, and after settling their affairs she was saying a final farewell to the town. She had climbed the tower because at last she could, knee surgery having given her back that ability. Looking at the town below us, we traded memories. Do you remember Lynn Street? The Indoor Market with it’s treasure trove of stalls? Corned beef slices, fresh from the tray? The sweet shop with chunky “rhubard and custards”? The docks were over there- do you remember the chain links and gangways? Hasn’t the town changed? On and on we went, reminiscing, exchanging snippets of our lives. We parted, finally, and I made my way back down to the ground, full of nostalgia for what had been, but a little proud of the survivor that Hartlepool still is. I can’t show you the past, but I can show you the now. Remember Blacketts, and Binns? Long gone. A new, and modern, stained glass panel. I don’t want to repeat the photos you can see on Urban Design, but I did want to share the experience. I wish the lady the very best for the future. I so enjoyed our memories. This is my entry for Weekly Photo Challenge : Nostalgic. Hey there restlessjo, been a while since my last comment – sorry about that! “I smiled back, and as I never can resist doing, slipped into conversation. ” – sounds just like me. Loved the photos and your story. Thank you 🙂 I’ve been missing a while myself so it’s no problem. hi Jo, I’m new visitor for your blog. really, you have a amazing account. Article is so much interesting and more informative. pictures looking nice. I sure do understand that. Whenever I travel, I leave the world of blogging and the world of the Internet behind, as I engage myself in the culture, folks, art, history, food, scenery of what exists around me. My sidekick SLR Nikon always by my side. Apparently you read my mind about wanting more of the view I liked so much last time in your blog post. Humm…Nostalgia of what had been, happen sometimes to me too, but today I try to enjoy the now, so thank you for those beautiful pictures. You must had a busy week, but I guess you will offer us a nice SWS as well. Nostalgic – memories, they are what man need, they make life. I love Your photos and the last one is my favorite among them. Just home so I’ll be catching up soon. What a nice post…it made me feel nostalgic as well. Not for the town you are speaking of but of all the towns we visit over the years and their changes. It’s a theme I could post on forever, I think, Karen. But first I have to start catching up with everybody. 🙂 Thank you. Those are the best kinds of encounters…sharing memories with a complete stranger. Am glad you shared this with us as well as your beautiful photos of Hartlepool. A lovely post, Jo. Yes, sometimes what first feels like an intrusion can end up being quite a nice encounter instead. The view from the Christ Church tower is gorgeous – as are your photographs which gives me a vivid impression how it is from the top of the tower. This is a beautiful story of an unexpected encounter (the best kind)! We wanted to share with you that we have nominated you for the Versatile Blogger Award: http://wp.me/p2Wkq6-cw because we enjoy your writing and photos and we appreciate the support you’ve sent our way. Thanks and enjoy! A wonderful encounter. And I disagree, you showed us the past. Words are an amazing way to travel through time.